Samuel R. Delany, Times Square Red, Times Square Blue (New York: New York University Press, 2001). 1 2018-06-15T08:49:38+00:00 Introduction 25 The Swish Alps: Exploring Queer Affect in Northeast LA image_header 795 2018-09-11T06:28:19+00:00 Research by Daniel Cazadillas-Rodriquez and Gavin Hefnner. Clicking on the audio file to the left offers Scalar users an aural collage of overlapping voices from our four oral history respondents, who together provide a provisional and palimpsestic history of a gayborhood. Each of the four following sections highlights an individual voice as a trace of the physical and psychic geography that José Muñoz dubs the queer utopian imaginary. While Muñoz holds that queer utopia is not a place but rather a concerted striving toward a horizon (by definition always just out of reach), he nonetheless spends the majority of his signature book Cruising Utopia talking about past queer artists and scenes that have striven to get "then and there" in specific locations, including the Christopher Street piers, New York City bathrooms, and LA club stages. Does such a cartography yield a map to utopia or merely a lament about what has been lost with the social ravages of HIV/AIDS, gentrification, and even smartphone cruising apps like Grindr? Muñoz answers that rational hope must draw from failure, affirming Judith "Jack" Halberstam's isolation of "the queer art of failure," wherein trying the impossible and failing delineates a dominant archive of modern queer cultural production. By these standards, queerness is inevitably a Janus-faced techne that gives as much credence to the past as it does to the future, while potentially hollowing out the immiserations of the present in the name of hope. This chapter speak to such haunted and utopian spaces through the history of the Swish Alps, a neighborhood in Northeast LA once known in the 1930s as "Edendale," then pitched in the 1970s as "East Hollywood," and now just called "Silver Lake" or "Silverlake" after its reservoir that attracts walkers and runners who circle its fenced-off waters. Nowhere will the term "The Swish Alps" show up on the LGBT memorial plaques that the city has deigned to put up over the "Mattachine Stairs" or the "Black Cat." Beyond city and realtor designations, the unofficial 70s moniker of the "Swish Alps" speaks to the ethos of local lexica and gossip that Muñoz's work valorizes. Our undergraduate students seized upon this dead letter to illuminate what tends to be buried when local contradictions are resolved and congeal into broad historical consensus. In a past about as accessible as its eponymous lake, we found the beginnings of a narrative much more complicated than the simple rise and fall of a gay neighborhood. We uncovered both tensions and connections between bohemians and yuppies, between gentrifiers and the gentrified, between white and brown bodies, and between lesbians/trans/gender-queer clubgoers and neighbors. Our archival materials include four oral histories from residents of Silver Lake, ephemera from their personal collections, and visual and mapping materials cataloged by our students and the ONE Archive. Centered on living narrators, our section historically starts in the 1970s when Silver Lake was known as the "Swish Alps," an edgier alternative to the more recognized gay enclave of West Hollywood. Grit and Glamour hopes to eventually gather more oral narrations and materials in order to flesh out the under-documented history of this gayborhood that is currently both enjoying and suffering historical commemoration and gentrification. We contribute to this Scalar project's leitmotifs of imbricated queer subcultures and an ethos of "cruising the archive" by demonstrating that one still needs to "cruise" raw sources to constitute an archive, in addition to "queering" extant ones. With our reliance on just a handful of oral history narrations, the issue of "experience" is central to our project. While Joan W. Scott warns us against uncritical and essentializing deployments of "experience," she concludes that it is a term we cannot do without. Accordingly, Scott proposes that we work with the concept of experience in order to redefine its meaning and operations. Part of this endeavor requires historians to recognize their own position and view their role as not just reproducers of knowledge derived from others' experience. Our current chapter-in-progress engages these quadrametric oral stories, visual stories, and Daniel Cazadillas-Rodriguez's reflection essay, "On Nostalgia and Melancholia," to frame the early stages of such experience-based story telling, where contradictions reign larger than historical consensus. Our attempts to bridge four "queer generations," with students in their early twenties and oral history narrators spanning nearly five decades, yielded a testimony to living archives and what Samuel Delaney has dubbed "contact" across class, race, and age. We listened. We heard conflicting versions of the oft-told story that Silver Lake has featured a tension between Latinx families and white gay men, the latter commonly understood to be the stylish renovation-oriented spearhead of gentrification. We listened to a gay musician who realized that his music scene was displacing older gay bars. We listened to a gay real estate agent who understood the neighborhood as at once gay and family friendly. We heard the stories of a gay Mexican-American man who saw the beginning of HIV/AIDS first-hand as an employee of Kaiser hospital. We saw the archives of a once glorious lesbian/trans club that occupied and honored the Silver Lake gay-male Leather past and present. Further questions for the ongoing study of the neighborhood include: Is the decline of queer retail presence in the neighborhood the result primarily of gentrification, gay assimilation, or GPS dating apps like Grinder or Scruff? Are there still a number of queers in residential spaces that are not reflected in “gay retail?” Do young queers even need the always already ideational space of a gayborhood? Inevitably, such queries invite nostalgia and melancholia. While Cazadilla-Rodriguez's reflection essay ruminates on this phenomenon from the perspective of a young gay man having missed Silver Lake as a robust gayborhood, our older oral history narrators speak of their ambivalent experiences in Silver Lake in its glory days. We hope that future iterations of this class will gather more oral histories to flesh out Silver Lake's story. 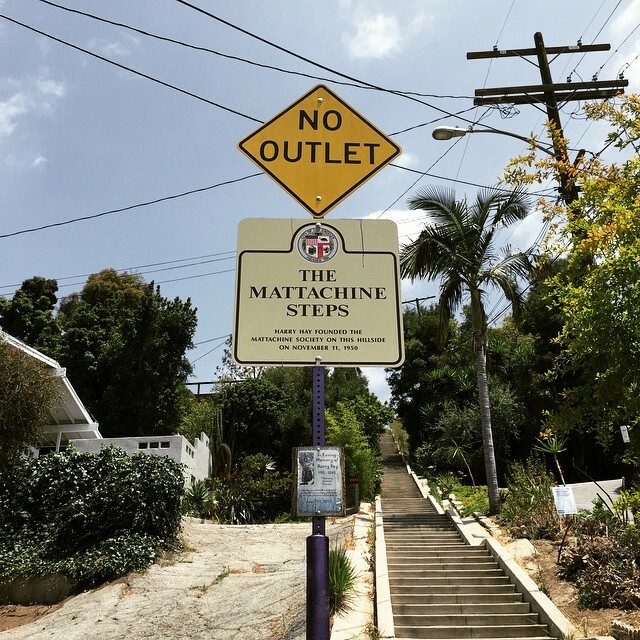 While acknowledging the limits of "experience" that Scott defines, we rely on the direct voices of our oral history narrators to offer a complicated narrative of Silver Lake, a neighborhood that was once a legible gayborhood. While a casual walking tour of the neighbor today bears witness to an explosion of expensive clothing stores, high-end restaurants, and gelato shops, we aim to use this virtual space to take you, the readers, back to the hilly streets that once made up the Swish Alps.